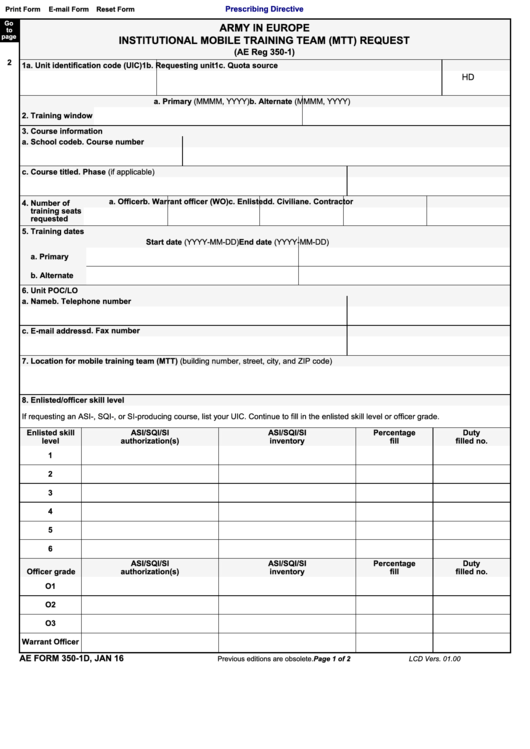 Download a blank fillable Ae Form 350-1d - Army In Europe Institutional Mobile Training Team (Mtt) Request in PDF format just by clicking the "DOWNLOAD PDF" button. Complete Ae Form 350-1d - Army In Europe Institutional Mobile Training Team (Mtt) Request with your personal data - all interactive fields are highlighted in places where you should type, access drop-down lists or select multiple-choice options. If requesting an ASI-, SQI-, or SI-producing course, list your UIC. Continue to fill in the enlisted skill level or officer grade.